One of the products that debuted at the Global Pet Expo 2011, held last week in Orlando, Florida was the YardPup & Paw, advertised as 'the ultimate poop scoop.' I can't speak to whether it is the ultimate one or not, but I'll tell you what makes it different from the ones you've seen before. 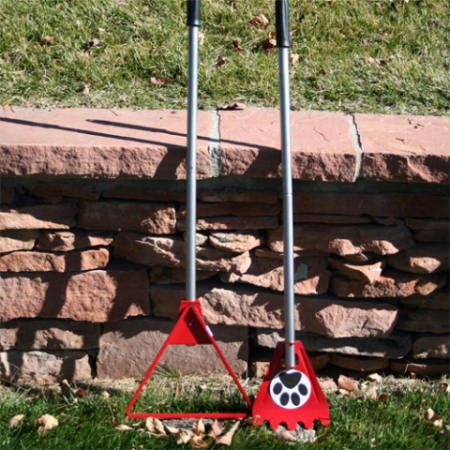 Like several other pooper scoopers of the standing variety, the YardPup & Paw uses two tools, one to shovel or sweep the waste and the other a receptacle to hold the waste. The YardPup has two innovative designs, one in each of the tools. First the shovel is multi-tonged, resembling a dog's paw (cute! ), so it can scoop the poop up from several surfaces - not just grass, but rocky or cement surfaces. Second, the triangular rim of the receptacle is designed as such so that a common plastic grocery bag can fit around it and be held in place by a fitted elastic cord, as seen below. In the image below, we are spared the sight of dog doo, by the designer's substitution of Tootsie Rolls, but I think we can all imagine what the stuff looks like. 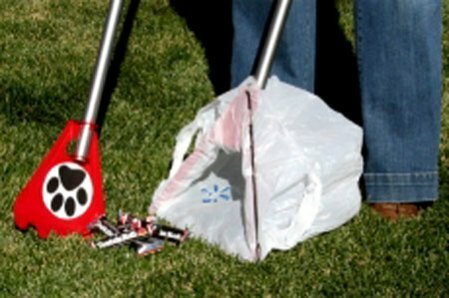 I'm a dyed-in-the-wool user of recyclable bags for poop picking up, so I can't tell you if the YardPup & Paw is "the ultimate poop scoop" or not. You be the judge. you can get it here. That's all the poop that's fit to print for today! We've All Seen "Planet Of The Apes" -- But What About "Planet Of The Pugs"? The Animal Video Of The Day!! !